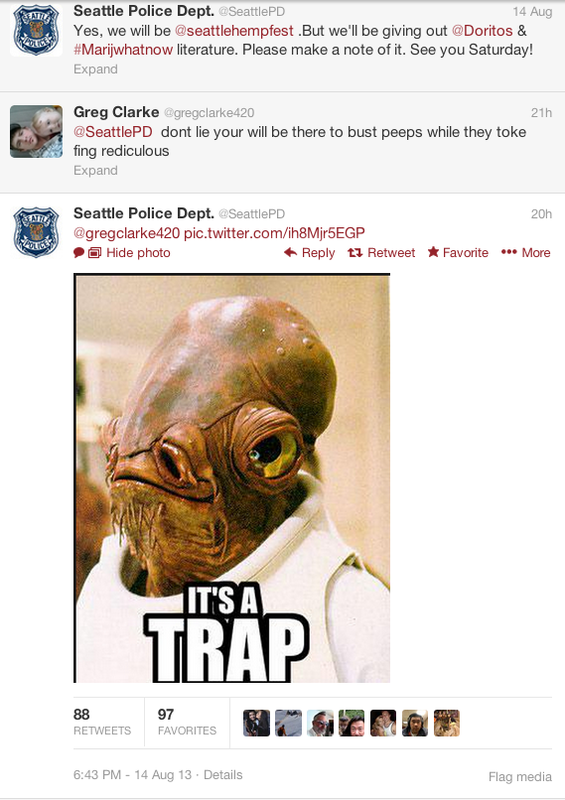 The Seattle Times reported today about a recent high flying PR maneuver by the Seattle Police Department. As is well known, Washington State recently passed legislation that allows for recreational marijuana use. To celebrate the new found liberty, bud enthusiasts are going to gather together at Hempfest, a three day long pro-cannabis event. The police department there has decided to take advantage of the opportunity and use it for educating the masses regarding legal aspects of marijuana use, as well as answering FAQs. The medium for their message will be a complimentary bag of Doritos. And the name of the project is Operation Orange Fingers. The social media and PR for the PD has been absolutely amazing. Normally I hate reading Tweets as usually they are some dire combination of egocentric, banal, and delivering info that I just don’t care about. However, the Tweets for this project are utterly fantastic. (See below.) Now the only question that remains is if I can swing the same thing in reverse here in NYC: if I bring a whole bunch of Doritos to Times Square will the police respond in kind by handing out free dime bags? Hmmm…. This entry was posted in Stunts on August 23, 2013 by The PR Ringmaster. China likes to look good. For real. (As opposed to my dimming the lights, squinting in the mirror, and finding the angle where I look the least like a PR professional.) The present predicament that the country has perceived for itself is that of the Chinese tourist. Specifically, a number of pictures and videos have gone viral that have shown Chinese tourists behaving in ways that are less than optimal. Now, being an American, my covering this story is such a case of “people living in glass houses”, that it’s hard to even continue. That being said, I will allow my American candor (i.e. obnoxiousness) to propel me forward. This entry was posted in PR News and tagged china, pr, public relations, tourists on August 19, 2013 by The PR Ringmaster. Beware the PR ides of August. Three major brands are striking out to redefine the prism through which their products are seen, but the success of these efforts seem to have struck a hollow nerve. Whether it’s scientific disbelief, social outrage, or just plain bewilderment, these attempts are notable for becoming anti-notable. 1. Diet Coke is Actually Healthy! Soda has always been the liquid bane of the nutritional world. Within that inglorious schema, diet soda has always occupied a unique niche. It has effectively functioned as the poster boy for the “well it’s not sugar but it is chock full of chemicals” conundrum. 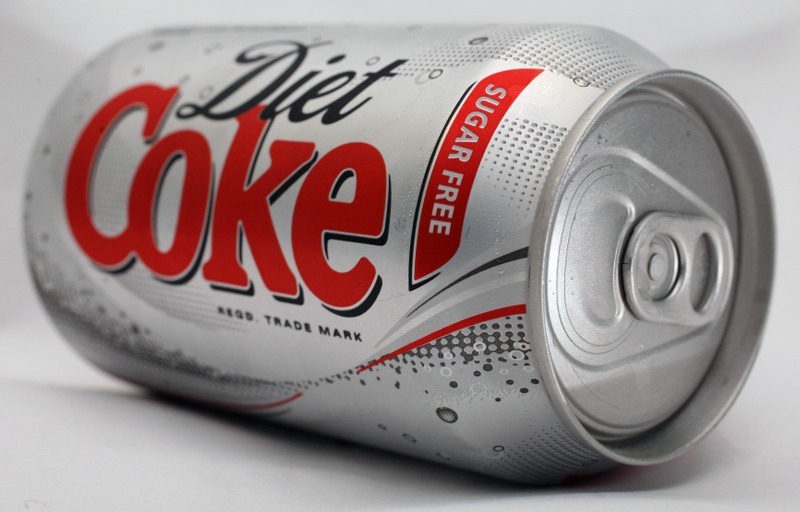 Diet Coke is now looking to erase that image and rebrand diet soda as an uber healthy alternative. The company will be running open advertorials promoting the healthiness and safety of artificial sweeteners. Maybe they’re just trying to win back the water drinking crowd, but redefining public perception on health issues usually requires a longer campaign than most ads can endure. It’s hard to believe that Diet Coke is in it for the long run and will rely on sustained health branding to move product. HTC makes smart phones. However (as you’re unconsciously well aware) HTC is not really providing any serious competition to Apple and Samsung. In an effort to become a name that draws people back to its products, HTC has launched what is rumored to be a billion dollar PR campaign starring Robert Downey Jr. The thrust of the campaign is that since nobody knows what HTC really is anyway, you might well just come up with something crazy and catchy to fill in the blank. Well, at least the people at HTC got to meet Iron Man. JCPenney recently… (Before we continue, do you have any doubt that the brand in question has suffered yet another PR disaster? Really?) Anyways, JCPenney recently ran a fairly innocuous TV spot that targeted kids who want to dress cool when they come back to school. Doesn’t sound controversial, right? However, with the luck of the Penney, it sparked a massive outcry as parents and activists complained that it promoted bullying for lack of fashion consciousness. I don’t know. Watching the ad provides for a fairly underwhelming experience, both on a fashion level, as well as a social one. It sure makes you nostalgic for the hyper excitement that accompanied the mailbox arrival of the Penney’s catalog. This entry was posted in PR News on August 14, 2013 by The PR Ringmaster. Giving away stuff has always been an old PR standby. Set up shop, announce the handout, and watch people (hopefully) flock to your booth/store/ event. Then (even more hopefully) hope that said handout inspires more purchases, name recognition, and overall profitability. It’s a fairly simple equation, and it makes one wonder why it seems at times so hard to get it right. Here’s two very recent examples that cause the eyebrows to arch ever so slightly. The Media: Check it out here. The Promo: Insidious 2 looks to build awareness by designing themed ice cream trucks promoting the film. Participants get a free ice cream if they share the event on social media. The Positive: Ice cream is an effective draw and is relatively cheap in terms of a PR budget. The Eyebrow Lift: There’s nothing interesting about this event, and no reason why media or anybody else would want to share it. Even though social media can push something viral with the right critical mass, that presumes that the content is interesting to begin with. There’s no captivating idea here or stunningly visual eye candy. The Promo: LG looks to build excitement in South Korea for its new G2 phone. A ton of helium balloons are released with coupons attached, and whoever snags one gets a free phone. The Positive: Free smart phones can certainly draw a crowd. Furthermore, the promise of playful elbowing in an attempt to snag the balloons can certainly provide for some humorous YouTube action. This entry was posted in Stunts on August 12, 2013 by The PR Ringmaster. The WSJ recently reported on an old school PR stunt that was taking place in the Big Apple. Broad Financial, a purveyor of self-directed retirement plans, put together a mobile acapella quartet that walked around the city singing about New York and self-directed retirement investing. The hook for the show was the costumes that the singers were wearing. Each one represented an iconic NYC skyscraper, and towered over pedestrians at a height of ten feet. Now singing performers used to be the old (as in decades old) standby for company publicity, but the notion has seemingly met its demise at the hand of a vibrant social media. It will be interesting to see if a classic attempt at entertaining the crowd will convert into greater brand awareness. This entry was posted in Stunts on August 9, 2013 by The PR Ringmaster. John Vassilaros is running for Mayor of New York. Sort of. Although fake political campaigns have a rich history as an effective marketing device, this one is unique in the fact that the intended audience is only NYC. Besides the fact that all media is national, (not withstanding the fact that all politics are local,) here we have a case of a local company trying to stay local and competing against the big national companies in order to do so. Can a relatively small time coffee supplier win the war against Starbucks and other prominent brands? Let the voters decide. This entry was posted in Stunts on August 8, 2013 by The PR Ringmaster.